Apple just joined the 21st Century by launching an official Instagram account. You can scope and follow @apple right now, if you're so inclined. 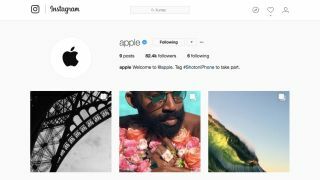 Apple's Insta appears to be solely focused, at least for the time being, on highlighting "Shot on iPhone" photos and videos, images that are part of a campaign Apple launched to show off the snapping prowess of the iPhone 7 and iPhone 7 Plus. Previously relegated mostly to billboards, Shot on iPhone has moved to a higher-tech and much cooler platform. #ShotoniPhone by… - 1. Fabien B. @fabienbaron “These photographs are my personal mood board. This is what I see and like.” - 2. Jess R. @jessronagrooming “If I could choose only one type of dog to groom for the rest of my life what would it be? Oh my gosh. A poodle!” - 3. Josh N. @bellpayphoneproject “This is street furniture that’s been around for almost a century and it will be gone soon. Gone forever… and I’ll be telling my grandkids about this nerdy project where I took pictures of phones with a telephone.” - 4. Brock D. @brockdavis “I’ve created so many things just to make my kids laugh at breakfast time.” - 5. Olivier C. @oli_op “I am drawn to things that look mundane at first, but then become magical because you’ve changed one factor - the speed at which you see it." The account currently features nine gallery posts, all having gone up earlier today, each with clips of photos and videos taken by different users. Almost every set is accompanied by words spoken by the photographer, and the voice-overs explain things like their motivation to capture certain images or their feelings on photography in general. It's an eclectic and creative mix, and Apple is inching close to 100,000 followers at the time of writing. iTunes and Apple Music had their own official Instagrams before today, but this marks the first time Apple proper has joined the service. Rivals like Google, Microsoft and Samsung beat Apple to Insta, too. It's a smart move by Apple to launch an account on the world's biggest photo sharing platform for several reasons (here's one: Millennials), but this could also be setting some crucial groundwork for the iPhone 8 launch next month. With the camera a perpetually important piece of the new iPhone puzzle, being able to show off shots taken with its snapper and highlight the 10th anniversary iPhone on Instagram is yet one more (and totally hip) way for Apple to connect with shoppers. Anyone can "submit" photos to be featured on Apple's Instagram by tagging their posts #ShotoniPhone. Who knows, you could be next!